Ontario's "The Merry Widow" is a winner. It's the kind of evening in the theatre that has a great start and just gets better and better. The love of the cast and musicians for this operetta pervades every aspect of the performance from first to last. "The Merry Widow" ("Die lustige Witwe" in German) has been one of the world's most popular operettas since it premièred in Vienna in 1905. Its music is of such a high order of invention that it has become one of a handful of operettas to join the repertory of the world's great opera houses. 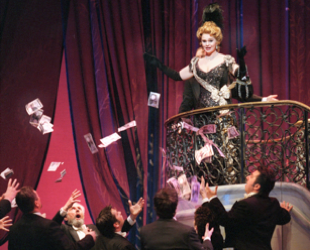 Like "Die Fledermaus", "The Merry Widow" is set in the contemporary world of its creators which it has since come to immortalize--1870s Vienna in "Die Fledermaus" and Paris at the turn of the last century in "The Merry Widow". The operetta begins in a whirl of activity in Paris at the embassy of the tiny fictional country of Pontevedro. Hanna Glawari, the young widow of the wealthiest man in the country, is in town and it is of vital importance to Baron Zeta and the embassy clerk that she marry another Pontevedrian as soon as possible--and not one of the score of Parisians pursuing her--so that her millions will not leave the country and bankrupt it. Unfortunately, Danilo Danilovich, the most eligible Pontevedrian in Paris wastes his affection on the "grisettes" of Maxim's and his money on gambling. He also has an aversion to Hanna since she spurned his love when they were young. In the deliciously laxity of Paris where marriage vows are meant to be broken, the baron's own wife is having an affair with a Frenchman which his own bumbling prevents him from discovering. Whether Hanna and Danilo will ever get together and whether Valencienne and Camille will be found out are the twin threads that lead us through Lehár's incomparably melodic score. This production is so successful because all of its elements are in harmony with the work and with each other. Canadian director Brian Deedrick, unlike so many who approach comic opera, has wisely decided that the work is funny enough on its own without added gimmicks, gags or updating. He directs the operetta with the same attention to detail and character as if it were a comic play where the cast just happens to break into song and dance. Scene after scene is staged to heighten the dramatic impact of the work, whether it is Hanna's entrance tossing banknotes at her money-hungry admirers or the non-singing scene of Act 2 when a waltz offstage subtly rekindles Hanna's and Danilo's memories of love. The vitality that courses through the stage action is matched by the taut conducting of the young American Alexander Frey. At every turn he chooses the perfect tempo and leads the Kitchener-Waterloo Symphony to play this familiar music with such freshness that it sounds newly minted. There is so much dance in this operetta that Allison Grant's choreography shares equally in its success. Whether it is the many expected waltzes, the series Pontevedrian national dances, the boisterous can-can of Act 3 or the hilarious routines for the men in "Ja, das Studium der Weiber ist schwer", her work, like Deedrick's and Frey's, is always imaginative and elegant. Opera Ontario has borrowed a beautiful Art Nouveau-inspired set from Virginia Opera and rented an exquisite set of costumes. Stephen Ross's lighting so blends the set and costumes you would not know they were from different sources. He creates an especially lovely mood of nostalgia in the garden scene of Act 2. The all-Canadian cast is well-attuned to the Viennese style. Theodore Baerg more fully characterizes the rakish Danilo than I've seen before. He makes clear that Danilo's life of pleasure is really an attempt to distract himself from love lost as he makes clear in his increasingly bitter reprise of "Da geh ich zu Maxim" in Act 2. His strong, ringing baritone and intelligent phrasing ideally suit the suaveness of his character. In the title role Eilana Lappalainen, a fine actress, gives us a Hanna by turns elegant, folksy, sentimental and wild. She certainly must be one of the few opera singers who can hold her own in a can-can line! Still, there is no disguising the fact that her powerful voice becomes squally under pressure, with her top notes clear only if floated. Because it lies lower and is sung softly, the "Vilja-Lied" in Act 2 is her finest moment. In secondary roles, Liesel Fedkenheuer, fresh from the COC Ensemble, gives a vocally and dramatically assured performance that makes Valencienne's vacillating scruples about her affair both comic and believable. Kurt Lehmann's Camille de Rosillon is not quite up her level, pleasant but not as powerful of voice and not making enough of the comedy or romance of his role. The comic roles of the pompous Baron Zeta and the harried clerk Njegus are played to the hilt by Gregory Cross and Jim White. Their interactions are laugh-out-loud funny. White even has the chance to display his dancing skills familiar from his many Stratford appearances. Hugues Saint-Gelais and André Clouthier are Danilo's ineffectual Parisian rivals, with Clouthier making the more positive impression. The contribution of the chorus and dancers is excellent. Deedrick has made the right decision in having the large swathes of dialogue that set up the action played in English while the classic songs are sung in German. It is one of the peculiarities of the perceived split between "popular" and "high" culture that the top price tickets for this eminently accessible, highly entertaining operetta with a cast of - and with - musicians in the pit should cost less that the equivalent ticket for a big musical in Toronto or Stratford with fewer personnel on stage and with at most 15 amplified musicians. If this "Merry Widow" had a longer run, I would not hesitate recommending it to people for their first opera. They would find that it is not as alien as they might suppose. Now that the Canadian Opera Company has moved into more abstruse repertoire, I am glad to see a company like Opera Ontario picking up the kind of large-scale operetta that the COC has seemingly abandoned. In future, I hope we see more of Johann Strauss, Franz Lehár and even Emmerich Kálmán in Hamilton and Kitchener. For, a production like this where all the elements come together can truly raise one's spirits. At the end of the show when the audience is showered from above with Pontevedrian banknotes, it suddenly seemed like New Year's Eve in May. Photo: Eilana Lappalainen as Hanna Glawari (on stairs). ©2001 Opera Ontario.